The Sequel Too Scared To Be Called A Sequel. It’s a pity that the most promulgated and available versions of these old movies are those versions doctored by racist pigs and venal corporations. This version of GODZILLA RAIDS AGAIN, the sequel to 1954’s GODZILLA, is the United States edit that was renamed GIGANTIS: THE FIRE MONSTER, with the English dubbing actors putting on Japanese accents (nothing racist about that! ), with an irritatingly buoyant narration from the leading man, that is not in the Japanese version. With the success of GODZILLA, Toho Company rushed this sequel out, and we can discern that the original version is probably a mediocre monster movie, but of course, to release it in America, studio execs had to first cut it to shreds and add their own idiot narration because America Best Movie Champions, thereby turning it into an execrable piece of dinosaur dung. A Japanese pilot crash-lands on a remote island and discovers Godzilla and Anguirus (an ankylosaur-thing) fighting. Rescued by his best friend, they both report to scientists who identify the monsters. The great Takashi Shimura in an embarrassing cameo, reprising his role from GODZILLA as Dr Yamane, runs stock footage from that movie as if it was filmed by him to explain Big Monster Theory. Yamane tells how that last monster was killed, after it “wreaked havoc more dreadful than the hydrogen bomb.” Ooh, another message? Not really. Yamane retains none of his conservationist predisposition from the last film – he’s an exposition device, nothing more. And how do we take anyone seriously with those dubbed cartoon voices? You should hear these disrespectful American assholes putting on their doofiest voices to make these poor Japanese actors look like imbeciles, especially the leading man’s buddy, who is voiced by Quick Draw McGraw. For some reason, Japanese cities are threatened by Godzilla and Anguirus, who turn up to fight for no reason. And I wondered why they were in fast-motion; as we all know, slight slow motion makes these creatures look big. From imdb, we learn that “Special effects director Eiji Tsuburaya wanted the fight scenes filmed in slow motion, but a camera technician accidentally undercranked the camera instead of overcranking it, resulting in the action appearing faster than reality. Tsuburaya liked the effect, and decided to use it in the film.” Makes for an interesting anecdote – but that doesn’t mean the film somehow possesses an inherent quality because of it. Canon Note: This is the first time Godzilla is pitted against another monster. And his roar has been tweaked (something to do with the name change to Gigantis). Director Motoyoshi Oda tries to recapture the fearsome aspects of GODZILLA (cities on fire, people evacuating, toy houses destroyed) but it only seems like plagiarism of Toho’s own property. So America is not exclusively to blame for venality. The fact this lackluster movie was rushed out to cash in on GODZILLA’s popularity is venal itself. There is practically no plot, except monsters fighting that need to be stopped. So it is almost ludicrous speaking of a subplot involving two ladies who love our leading man and his best buds, romances so flimsy that when the best buds goes up in a ball of flame, there isn’t so much as a music cue. 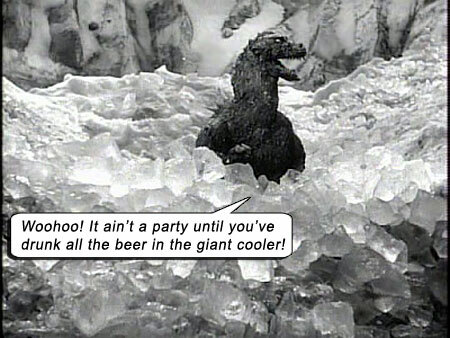 “Fire Monster” turns out to be an ironic name, as Godzilla’s ultimate fate is being buried in ice (to be resurrected in KING KONG VS. GODZILLA, with a completely rewritten history again). CONTEXT: in 1959, you could count the awesome giant beasty movies on one hand: THE LOST WORLD (1925), KING KONG (1933), THE BEAST FROM 20,000 FATHOMS (1953) and GODZILLA (1954). We try to put ourselves in the seats of the young audiences who thrilled to these spectacular movies, seeing dinosaurs – or at least, things that looked like dinosaurs – come to life. These old movies did not comply to the cinematic techniques that we’ve grown accustomed to. We have been conditioned to having our emotions manipulated in a very structured way with modern movies (and of course, we are children of CGI), so we forget the differing conditions and conventions that audiences used to respond to. Can we blame American execs for dumbing down overseas movies for American audiences if American audiences are in fact so dumb? aka: GIGANTIS THE FIRE MONSTER. Writers: Shigeaki Hidaka, Shigeru Kayama, Takeo Murata. Starring: Hiroshi Koizumi, Setsuko Wakayama, Minoru Chiaki, Takashi Shimura, Masao Shimizu, Seijirô Onda, George Takei. GODZILLA: Haruo Nakajima. ANGUIRUS: Katsumi Tezuka. Version: U.S. edit, w. English dubbing, narration.